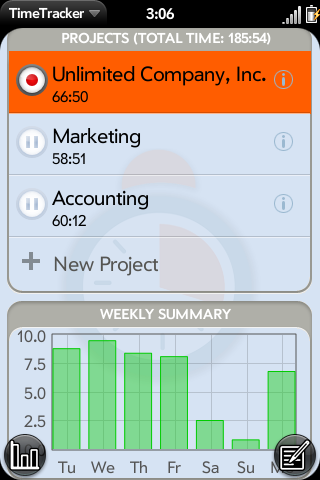 TimeTracker is an application to record your working time, associate it with projects, and annotate it with comments. At the end of the month (or any other time) you can display your data in various charts and you can email a detailed spread sheet with your working time. Project sort order gets saved and restored. Sum of time and money in details table on chart page. Save battery by disabling screen updates when application is minimized. Additional upgrade mechanism through palm's application store. Improved format for exported spreadsheet. Correct language of PayPal web site is now user language and not always german. Backups are now compressed. This reduces their size typically by 75%. Restore is able to deal with the new (compressed) and old (uncompressed) format. Bug fix to prevent crashes with webOS 1.4.1. Bug fix of deleting a project after having done a backup. Backup and Restore of all data to restore in case of emergency or to transport data between different time tracker applications or versions. A table showing exact numbers for hours worked or money earned on the project chart page.